Colleagues, trainees, friends, and family of Savio L-Y. Woo, PhD, DSc, DEng, Distinguished University Professor of Bioengineering and the Founder and Director of the Musculoskeletal Research Center, organized and participated in a day-long event on August 29th to celebrate Dr. Woo’s 47-year academic career and his significant impact on orthopaedics and bioengineering– both in the advancement of the science as well as the clinical implementation of emerging technologies. The “Bioengineering and Bioscience Research and Education: Think More, Ask More, Do More” Symposium consisted of 38 presentations by former students, residents and fellows, and colleagues and friends highlighting Dr. Woo’s contributions to the formation and advancement of their careers, and the advancement of the science of orthopaedics and bioengineering. The participants came from across the U.S. and from 10 countries. During his career, Dr. Woo trained over 530 junior faculty, orthopaedic surgeons, post-doctoral fellows, and students. His trainees now are leaders in many sectors, including academia, medicine, engineering, law, government, and corporate environments. Amongst the University leadership who came to celebrate Dr. Woo’s accomplishments were Chancellor Patrick Gallagher, Chancellor Emeritus Mark Nordenberg, Provost Patricia Beeson, Provost Emeritus James Maher, Dean of the Swanson School of Engineering Gerald Holder, Chair of Bioengineering Sanjeev Shroff, and Distinguished Professor and former Chair of the Department of Bioengineering Harvey Borovetz. Provost Patricia Beeson presented Dr. 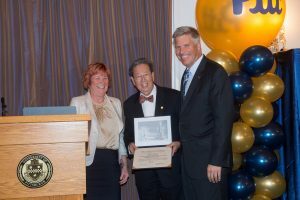 Woo with a certificate recognizing his appointment as a Distinguished University Professor Emeritus. The designation of Distinguished University Professor is the highest honor that can be accorded to a member of the faculty. Congratulations, Dr. Woo. Thank you for your substantial and sustained contributions, and best wishes for continued success! Illustration: Provost Beeson, Dr. Savio Woo, and Chancellor Gallagher. Credit: Michael Drazdzinski.